And my answer: Lake Guntersville. Lake Guntersville is where I grew up fishing, and where I fell in love with the sport. I’ve spent more time chasing fish on that water than I care to admit, but I don’t regret a single second of it. Along the way, I’ve picked up my fair share of knowledge about the lake, and I’m here to share that with you today. Lake Guntersville located in Northeast Alabama, 45 minutes from Huntsville. It is a manmade lake that was formed by TVA by damming the Tennessee River with Guntersville Dam. It is 75 miles long from Nickajack Dam in the north end, to Guntersville Dam on the south end and covers 69,000 acres of water, making it the largest lake in the state. The Lake is known for water skiing, wakeboarding, and boating as well as its beautiful houses and landscapes. But, what it is world renowned for is its world-class fishing. Most of the time, fishermen on Lake Guntersville are there with one fish in mind: the Largemouth Bass. In fact, experts say that 66% of fishermen on average are there specifically to target largemouth only. 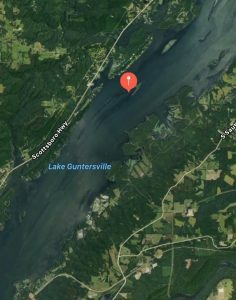 Alabama’s Department of Natural Resources has been conducting fishing surveys on Lake Guntersville for years, and they have seen the size and number of fish increase. This is due to the large amount of aquatic vegetation and baitfish that the lake holds as well as a 15-inch size limit for largemouth placed in 1993. In fact, their surveys show that Lake Guntersville is the best lake in the state to catch a bass over 5 pounds. 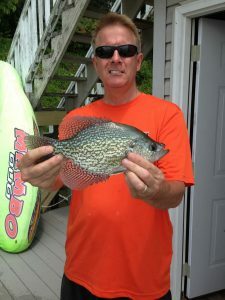 But, while the fish in Lake Guntersville are large and plentiful, they’re not easy to catch. That same research also indicates that anglers catch less bass on Guntersville than you would expect given the fish population. That is because the fish receive a large amount of fishing pressure, and are therefore more difficult to catch. That’s where we come in to help you, but we’ll get to that later. Lake Guntersville also has opportunities to catch fish other than bass. The lake holds monster catfish, plenty of crappy, and more bluegill than you could ever possibly catch. 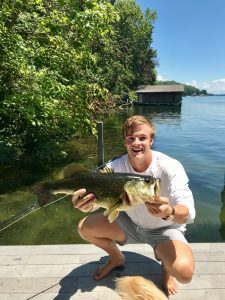 Fishing on Lake Guntersville is similar to fishing in other places, with a few noticeable differences. The general idea is still the same: find where the fish then determine what they’re eating. But on Lake Guntersville, where the fish are doesn’t usually change. 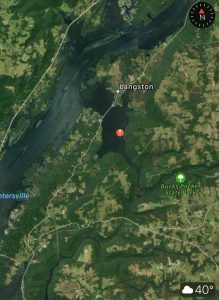 Unlike on other lakes where bass will migrate considerable distances to hold in different areas during different times of the year, Lake Guntersville bass and other fish tend to stay in the same areas. Most fish will be along the steep drop-offs in the lake where the old riverbank is. The depth change there provides them cover and attracts baitfish. Other fish can be found in the aquatic vegetation, around boat houses, and in the shallows. To bass fish on lake Guntersville, I use rubber worms presented slowly, or topwater flies or poppers if the water is calm. In the winter months, you can experiment with rattle traps, crank baits, and spinner baits. 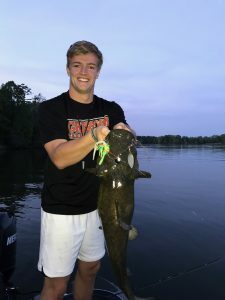 The cats in Guntersville can grow to be over 100 pounds, but you’ll usually be catching them closer to the 5-pound range. The best way, by far, to catch them is to tie on the biggest live worm you can find and sink it straight to the bottom. Catfish are dumb, so you can leave your rod unattended while you wait for a bite, giving you a chance to fish for bass or drink a cold beer. Bass fishing on Lake Guntersville can be hard, and sometimes the catfish aren’t always biting. But during those times, don’t just pack up your tackle. Go grab your ultralight and bait your hook with a live cricket. 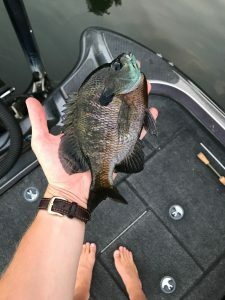 Throw it around any submerged structure or near a boat dock, and you’ll catch a bluegill. But, my personal favorite method of catching bluegill on Lake Guntersville is during the summer mayfly hatches. These summertime dinner bells bring fish from all over the lake into shallow water, where they can easily be caught with a fly rod. Just tie on something that slightly resembles an insect, and gets after it! As I said earlier, the fish on Guntersville stay basically in the same spots. Because of that, when people find the fish, they rarely share their information. So, I’m not going to give away too many of my honey holes, and will instead just give you a couple. This spot is located in the middle of the lake, directly between the town of Guntersville and town of Scottsboro. Pine Island, as it’s called, was an island that was originally in the river before the TVA flooded it. It is now a bass paradise teeming with aquatic vegetation. During the summer months, the grass grows high enough to make boating a problem, but the fishing is still good. In the winter, fishing around the edges of the island can be especially productive. This spot is located near Bucks Pocket State Park and the town of Langston. During the summer, the boat traffic slows the fishing down, but it can get hot in the evenings and early mornings. The winter months usually provide amble opportunity throughout the day. Fishing on Lake Guntersville truly is a fisherman’s dream. If you get the chance to go, you should not turn it down. You’ll have a chance to catch a monster bass, catfish, and as many bluegills as you can reel in. 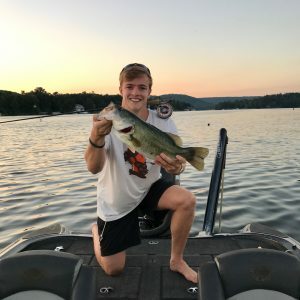 I grew up in North Alabama fishing for largemouth bass on Lake Guntersville, the Tennessee River, and any other body of water I could find fish in. After graduating from The University of Alabama, I moved out west where I fell in love with fly-fishing for trout.